This quote struck me like lightning. Not that I had not read it before, but just that now I understood it better. I happened to meet a school friend of mine, a few days back and I realized my life was better than so many others. I had things that others yearned for and here I was cribbing for things I don’t have. It is human nature, isn’t it? We need more and more and are never satisfied. Reminds me of dad’s gyaan – ” One should be satisfied with what he has but not contented.” I probably took this more seriously. I am not sure, but I am a person who gets happy quickly and sadness comes my way the same way. While I appreciated life and the small things that life had bestowed I chose to ignore so many things that I had to be grateful about. Gratitude is not my natural disposition and expressing has been a difficult thing. It isn’t easy to remain positive and thankful for life when obstacles are plenty, failed attempts ample and fear looming. Times when everything goes wrong and you wait for days to pass away quickly appreciation is the last thing I would do. I have come to understand that life will remain so forever like this just that few days would be better than others. One has to experience pain and sadness to appreciate happiness. There are disappointment and sadness in this world but yet I see so many people happy and I realized it was their choice. They chose to be happy and grateful and that made all the difference. I have been generous in appreciating others. I know how happy my colleague would be if I complimented her or appreciated her efforts. Be it appreciating a blogger’s post, a piece of art or efforts made by others to make a thing happen,I appreciate. And small gestures like these makes a person’s day. But when it came to me and what I had I was hardly thankful. For my own happiness and well-being, I CHOOSE to be grateful for what I have and complain less. I start it today,right now by thanking you for reading this, coming back and appreciating what I write. I am so grateful to have such beautiful and encouraging people around me. Also, I am taking my Alexa rank to the next level with Blogchatter . Once again a lovely post. It takes a lot of maturity to acknowledge what we lack to get what we need. Love your self introspection posts, Ramya. Lovely post, Ramya! It’s becoming like a habit now a days to read your posts on life lessons.There is a lot am learning on your space.Thanks and Keep writing! Brilliant post Ramya. Really being grateful will help you a lot. We too are grateful to you for such life lesson posts. 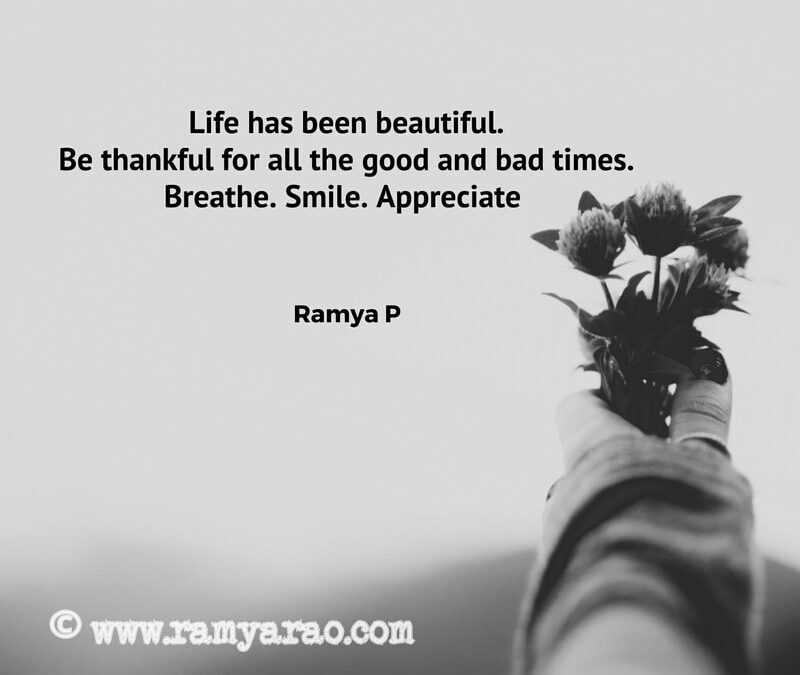 Gratitude has been life-changing for me, Ramya. I’m happy to hear that it’s working for you too. It’s great to recognize and express gratitude to people. being humble and full of gratitude maketh a man! Happy Birthday girl. WOW!! Ramya -this is such an amazing realisation and acceptance of it. Very mature and wise beyond years – that reminds me Happy Bday darling – Hope you are having a fabulous day! If only we could all accept our reality with gratitude than dreaming about unknown with more attention and yearning than what it deserves. Power of thoughts – cheers to it! Perfect post for the day Ramya. We are judged and perceived the way the world looks at us and therefore, we always see external factors and forget the small things of happiness and gratitude. In studies its the comparison, in work the same. In life , between siblings. I think appreciating what we have changes so many things we are able to accept things the way they are and become more peaceful. We learn and respect. you are right. one must enjoy what one has than keep longing for what one does not have in comparison with some one else. we tend to compare ourselves with our peers, relatives or equals and get disgruntled and in the processs do not enjoy or even acknowledge what we have and miss good things in life. Gratitude is very hard to practice and yet it is a must….Strive but remain thankful for what you have, your dad rightly said it. Practicing Gratitude has changed my life.Thanks for this brilliant post on life lesson.Keep writing! Gratitude may be relative to everyone. Sometimes it may be meant as being contented also. But I think being grateful is essentially being thankful for everything you have. Gratitude is something we often tend to overlook, thanks for the reminder to have it in us. Lovely read. Nice post Ramya! It is very difficult to feel gratitude ‘when obstacles are plenty, failed attempts ample and fear looming’. Very true!. We have to overcome this attitude. Days are flying fast and we are chasing our dreams so vigorously that we often forget the people around s and those who are looking up at us. Gratitude when practiced in fact brings in lots of positivity. I have seen that personally and have been overwhelmed by the results. I have been witness to this nature of yours. I have been practising positive strokes for a long time. In most cases, it helps spread warmth and happiness. But many times it is viewed as artificial behaviour. I guess that is because there are very few people who are appreciative in this world. I take it in my stride and move on.